← Happy Thanksgiving from JNC! Toyota MR2 Back from the Dead? Good grief, Charlie Brown! There are many things to be thankful for this Thanksgiving, but Toyotaku may have just received the greatest gift of all. Japan’s Best Car magazine is reporting that an affordable, mid-engined sports car might be in the works! Does Toyota president Akio Toyoda have a Dr. Frankenstein complex? He sure seems to love bringing back old Toyota sports cars from the dead. He’s even using electricity to do it, as the rumored MR2 would be a hybrid. This is still pure speculation right now, but we thought this news, as reported on Autoblog, was worth tearing ourselves away from the turkey for. But if this proves true, Toyota may have engineered, in one year and with the help of the Lexus LFA and Toyota FT-86, the most dramatic image turnaround in automotive history. tagged: akio toyoda, aw11, ft-86, lexus, lfa, mr2, sw20, toyota. 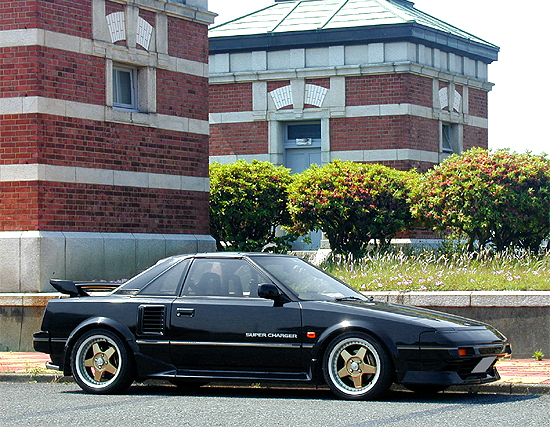 19 Responses to Toyota MR2 Back from the Dead? @Bert : rear wing was an aftermarket for the ’86, ans maybe de earliest ’87, but it was stock for the next years because so much person asked for it. I’ve one on my ’88 mk Ia. That car was made for windy sideroads. I would always look for an excuse to take the indirect route if I had that MR2 (or any MR2). @Nigel-When I had my 86 I was always taking forever to get somewhere! Even bone stock the thing was phenomenal around corners( thats how I won most if my street races! But shh! don’t tell anyone!) I’d always find some excuse to take the windy roads around Seattle, even if I was only going to the store. BTW-Bring A Trailer has a minty fresh 86 MR2 with 36,000 miles on their site, where it is recieving much love, though some people are screaming crack pipe on the $8,900 price! True classics indeed! I’ve had my 2000-model for seven years,and it’s the love affair that never fades. hehe, My Ex used to have a nice AW11. I put a K&N on it. I loved the way it sounded when the TVIS butterflies would open. Although the power increase wasn’t even noticeable, it still made me giddy every time! Bring back the Midship Runabout! I’ve had my 86 AW11 for 4 years, always a good time to drive. Not too keen on a hybrid though, I hope they give it a real engine and preferably a hard top. Not keen on a hybrid sportscar myself.Not very engaging to drive.Light weight is the key.They did,as I understand,learn a lot about light weight materials and how to keep down the cost of using such materials in the development of the LFA.Maybe the key lays there.Or perhaps they could enlist the consulting services of Lotus’ engineering department? Toyota and Lotus seems to have a very good colaborative relationship going,why not extended it further? A hybrid MR2 is utter nonsense. You can’t mix the purity of a small, responsive mid-engined sports car with the overwrought, overhyped and under performing snake oil of a hybrid system. Toyota and Lotus collaborated on the first MR2, it would only be right that they partner up on the next gen, if there is one! Well, Lotus already buys 2ZZ and Camry engines for their cars, so it would be interesting to see the partnership go the other way. I fear a hybrid MR2 would appeal to precious few buyers.It would be too impractical for politically correct motorists looking for something “sporty”,and not involving enough for enthusiasts looking for a proper sportscar.Splitting it into two separate concepts;a basic,light weight MR2 with a conventional driveline and a sporty two-door coupé version of the Prius however makes a whopping big bundle of sense to this highly opinionated Toyotaku. I guess we will have to wait and see about this rumor, I don’t put much weight to it. Right now the only car I am looking forward too is the new Lexus. This whole concept sounds like a contradiction in terms. I will just stick with my AW11, thank you. I still have a Mk1 MR2 (Mica Blue T-Bar). Still in pretty good condition though sadly off the road at the moment as I can’t justify running at because I only live 1 mile from work! Always wanted a Supercharger – the one shown looks pretty cool. Just thinking about MR2s makes we want to get mine back on the road! I think I quite like the idea of a new hibrid MR2 – though never been too keen on the Mk3 styling, so hopefully they’ll do something a bit different.